Not one, but two OLM Robotics teams walked away winners at the First Lego League Championships on Saturday, January 12th at Roger Williams University. 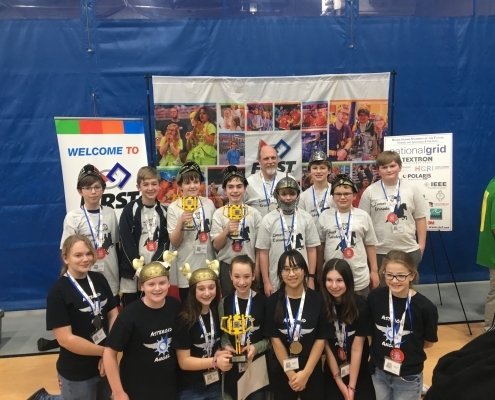 Out of the top 40 teams in the state, OLM Robotics Team, “The Comet Crusaders” won First Place in Programming and First Place in Robot Game and OLM Robotics Team “The Asteroid Angels” took home First In Strategy in the State of Rhode Island. In order to advance to the State Championship, teams must compete in all three judged areas of First Lego League – Robot Game, Project and Core Values. The two teams have spent tireless hours in preparation and have met with experts from various institutions such as Space X, Caltech and the University of Rhode Island to define and solve a problem that would occur in future long time space expeditions. The Asteroid Angels chose reuse and cleaning of clothing with minimal water supply. Their solution not only cleans clothes without water but it also provides exercise. The Comet Crusaders chose space debris as their problem. The team created a solution that would repel trash away from space vehicles back into the Earth’s atmosphere using Eddy Currents, the debris would burn upon re- entry. Rhode Island Students of the Future inspires young people to be science and technology leaders by engaging them in exciting mentor-based programs that build STEM skills, inspire innovation and foster well-rounded life skills including self-confidence, communication, and leadership. With a tradition of excellence in Catholic elementary and middle school education since 1951, Our Lady of Mercy School offers its students an opportunity to pursue excellence in academics, athletics and the arts on their journey as young saints and scholars. Accredited by the New England Association of Schools and Colleges, the Pre-K through Grade 8, co-educational Catholic school located in East Greenwich provides a nurturing, values-driven environment built upon the teachings of the Catholic Church.